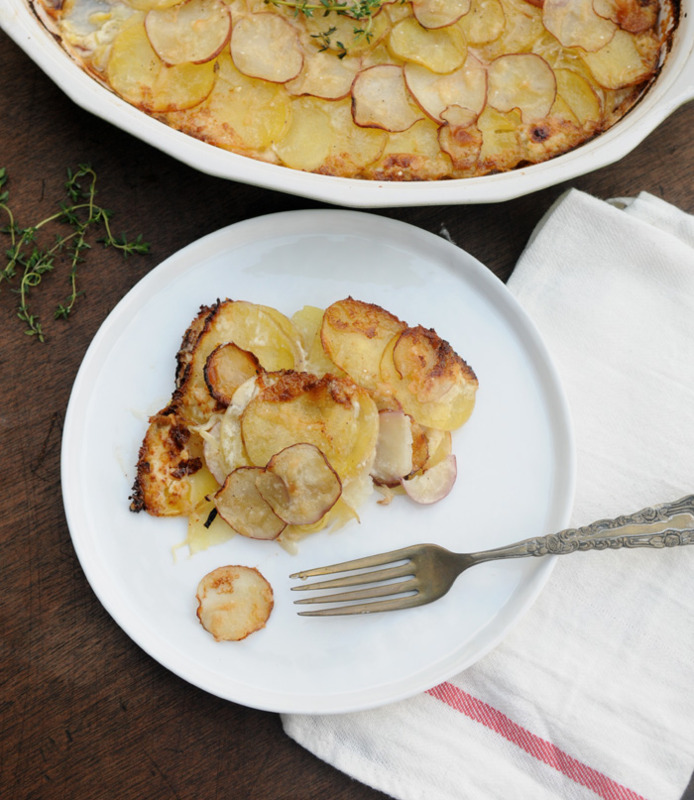 Potato Gratin — potato chips are not dinner. I figured it was about time I make a dish dedicated to this blog's namesake. The humble potato is a favorite in my household. Sometimes you just crave simplicity. Boiled, fried, mashed, we'll take it all! I don't think I have to tell you this gratin is amazing. Thin, crispy potatoes, leeks, butter, and a little bit of bubbling parmesan on the top- how could it not be? This makes an excellent side dish for breakfast, brunch, lunch, or dinner. We enjoyed it as a meatless main course. Adding some prosciutto would make it more hearty if you decide to go that route. The best part of gratin's are as long as you keep the base ingredients of potatoes, butter, and cream/stock, you can pretty much add whatever other ingredients you desire. Some kale or spinach that you'd like to use up, or any other vegetable would be wonderful. In my case, I wanted to work some leeks into this recipe. Their mild onion flavor and sweetness complimented the potatoes perfectly and cut through the creaminess quite nicely. The type of potatoes used for a gratin are important; they need to be of the waxy variety as opposed to the floury kind so they do not soak up too much liquid while baking, leaving you with a pan of mashed potatoes instead (I can think of worse things, though). I used yukon gold and baby red and they worked perfectly. I didn't peel them either, as they were sliced so thinly. I love the added texture you get when leaving the skin on potatoes. As long as they are scrubbed well why not enjoy those extra nutrients? I also really just hate peeling potatoes to be perfectly honest. Scrub your potatoes very well, and slice thinly. I used a mandoline, which not only saves a lot of time and frustration but makes sure all the potatoes will be of the same thickness and cook evenly. Slice your leeks and onions thinly . Cut your butter into small pieces. Butter a baking dish, and layer potatoes, butter, leeks, onions, cream/stock, and a sprinkle of cheese (if using) . Sprinkle each layer with salt and pepper. Repeat until you have 3 layers. Cover with tin foil and bake for 30 minutes. Uncover and finish baking for 20-25 minutes or until top is crispy and golden. Hurry, scoop up the good and crispy parts before someone else does! 2. Scrub your potatoes very well, and slice thinly. I used a mandoline, which not only saves a lot of time and frustration but makes sure all the potatoes will be of the same thickness and cook evenly. Slice your leeks and onions thinly . 3. Butter a baking dish, and layer potatoes, butter, leeks, onions, cream/stock, and a sprinkle of cheese (if using) . Repeat until you have 3 layers. 4. Cover with tin foil and bake for 30 minutes. Uncover and finish baking for 20-25 minutes or until top is crispy and golden.